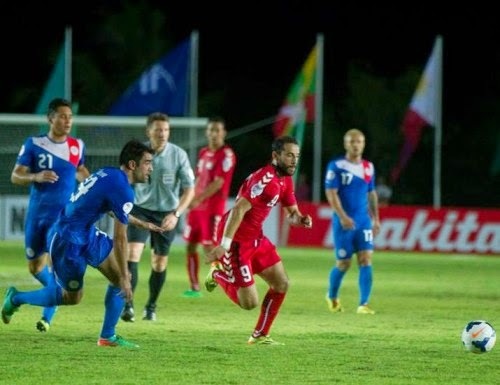 The Philippines Azkals fought their 2nd match in the AFC Challenge Cup 2014 against the Turkmenistan. Laos who had the first lost against the Turkmenistan last Wednesday, May 21, 2014 is trying to take their first win against the Philippine Azkals who a had a draw match against the Afghanistan last May 20, 2014. The Laos team who was never defeated by the Philippine Team had their take their first lost against the Azkals. In first half most of the dangerous shots are from the Azkals. The Laos had a hard time taking the possession and in the 41 minute mark of the game Stephon Schrock attempt was blocked by the Afghanistan goal keeper but Rota go for the follow up and the Azkals got their first point of the game. In the second half Azkals continues good possessions and had a lot of confidence. In the 63rd minute Phil Young husband pass the ball to Patrich Reichelt for a headed shot and the Azkals got their second point advantage against the Laos team. The game ends in a 2-0 lead by the Philippine Team. The next game of the Philippine Azkals is on May 24, 2014 against the leading team Turkmenistan.